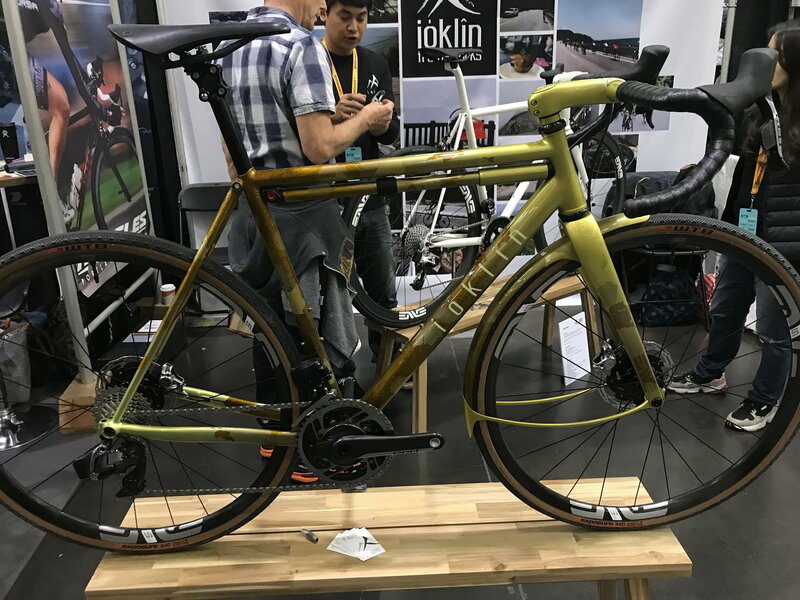 For those of you interested in looking at pictures from the NAHBS in Sacramento, here are some to enjoy. These bikes are simply stunning. 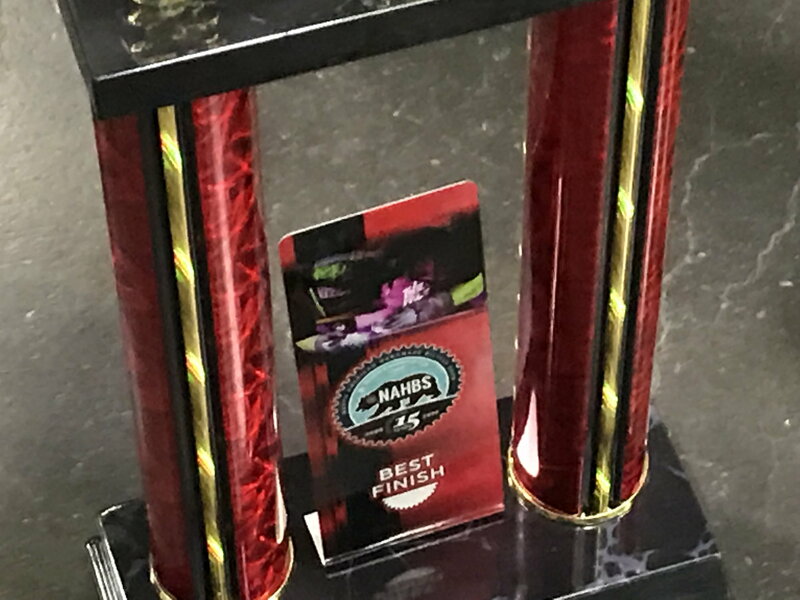 I've attached three that won awards. There are lots of other pictures in the Flickr link below. Arnold, thanks for posting. I hear it was one of the best shows and record attendance. Saturday was very crowded and Sunday a lot less so. I wasn't there Friday. Next time I think I'll just do a day trip on a Sunday. I was there on Friday and it was pretty nice...not too crowded. This was by far my favorite bike. It had a Gilco like tubing - not Gilco according to Roland but similar. Unfortunately he said he doesn't have any more sets of it. Lots of cool bikes this year. Would like to see C&V's reaction to the Dear Susan/BP bike. I have mixed feelings about that Porter. To me the seat tube cut out and lugs are just gaudy and overdone. The straight fork makes no sense. I really like the chainrguard though. I spent a good portion of my day on Saturday scrolling through pictures on Instagram. Some really incredible stuff. 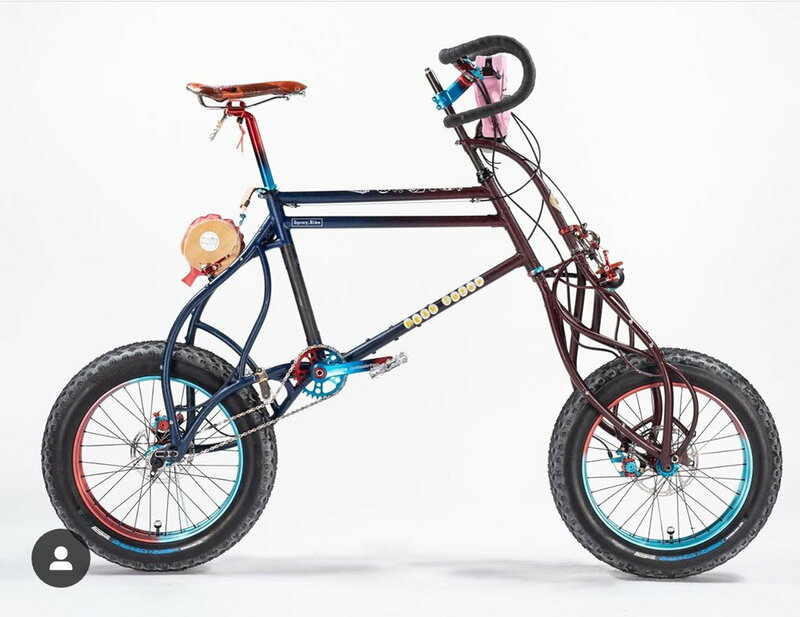 The Dear Susan/BP bike is really something else, it creates in my head such a wonderful dissonance of aesthetic hatred and mechanical wonder. I have similar feelings about the Porter. I started following him on Instagram in the early stages of construction, when he was carving the lugs. That drew me in and as it progressed through chrome and paint I got so excited thinking about a classically lined, drop bar road bike with those crazy chrome art-deco lugs. Then I saw a full picture with his seat tube, threadless stem and upright bars and I just didn't get it. 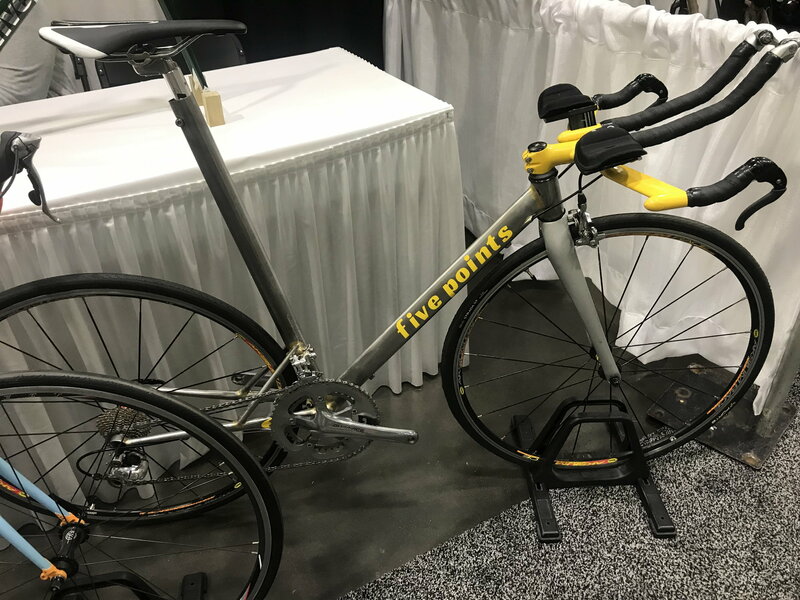 I know that he feels really strongly about why he wants his seat tubes to be designed that way, but to me it just looks so bad. Well, obviously the judges liked it. I spoke with Tom Porter, the builder. A very nice young man who wants to break into the industry. I wish him well. How about this no top tube minimal seat stays bike? Builder says rider weight limit is 140 lbs. I don't see how it can support even that. I asked one of the guys at the Della Santa booth what those holes are for in the chain stays of the Osso Bucco. "They accumulate dirt and grime and they look cool" was the answer. Gotta agree with him. Last edited by TenGrainBread; 03-18-19 at 01:01 PM. I saw that thing, it's a hoot. Gravel bikes as far as the eye could see. I enjoyed seeing SimWorks - a brand I hadn't noticed before though I guess they've been around for ten years. I didn't see Ventana and I don't think I saw them last time either. Wonder why they don't come. Local builders Squid and Steve Rex make me want to buy local. Squid's animal-cookie bike was great. I love the Porter Winged Victory bike. I saw it in person at the New England Builders' Ball last year after following the build updates on Instagram, and was surprised by how small it was! It's really well-proportioned and made to fit a relatively short rider. He does a lot of really clever stuff, but as someone else mentioned above, I'm not a fan of the seat tube (or the short chainstays, for that matter). If that bike was made with more relaxed geometry, I think it'd be an absolute masterpiece. Hoo boy. There's no way I would ride that on a road around here. I think SimWorks only started a US office in the last year and a half or so, and have ramped up their product line. Love Ventana as well. They were there via Squid Bikes, whose aluminum frames are made by Ventana. I really liked the details on the Porter. But not what I’d park on the street day to day. Too memorable. The front rack was amazing - cool Art Deco inspired shapes. hardly any old bikes' but there were new' retro builds from companies like Gardin and Della Santa. Cherubim was ther too with beautiful bikes. Calfee even brought their first ever CF bike. 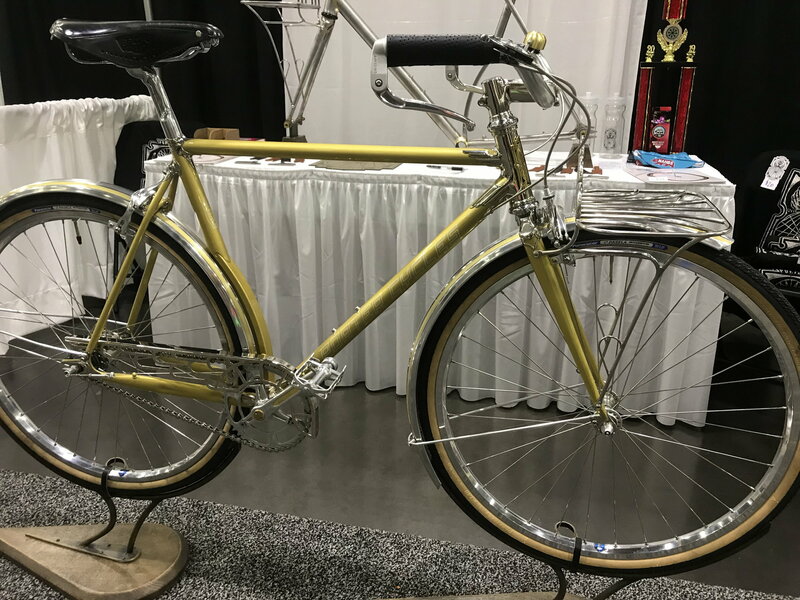 A booth had a nice Tomassini Super Prestige being raffled away. I'm not that familiar with Tomassini's but I suspect it was SLX. Saw that Kas Vitus 979 Team bike replica on top of the Mavic Volkswagen Brasil. They were selling nice Mavic shirts and the red bottles marked "Cub House" (as seen on the KAS Vitus bike) which I think was a sort of cutesy merchandise brand. I almost got a pair of the bottles as they look very similar to CocaCola waterbottles which I am looking for my Bottecchia. GCN was there. One of the women from their team with a mic and a camera man going through the booths. 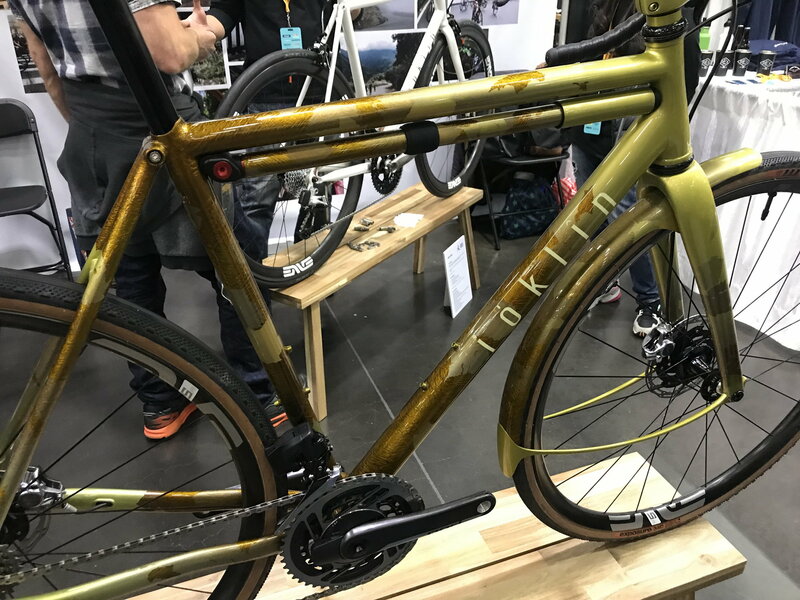 It was a nice show to see if you are interested in custom builds, but there was nothing being sold at the show except maybe taking orders for custom builds' and there were no C&V bikes except for the Mavic booth display KAS Vitus 979 and the Tomassini prestige being raffled off..... 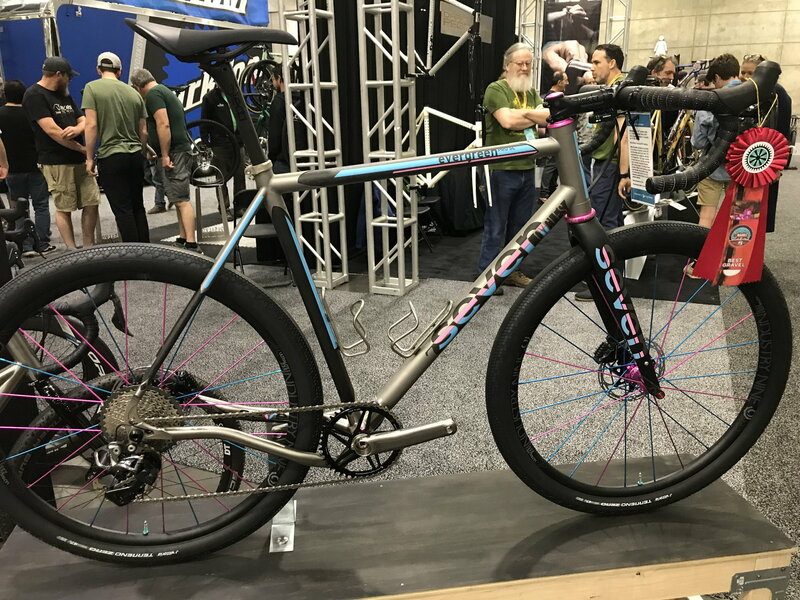 If you are into new build "gravel bikes" though, you would be in heaven. Last edited by Chombi1; 03-18-19 at 02:04 PM. "hardly any old bikes' but there were new' retro builds from companies like Gardin and Della Santa. Cherubim was ther too with beautiful bikes." How true! Very few steel lugged bikes, new or old. They are disappearing from the NAHSB landscape. Yup that was disappointing. A lot of wood and a lot of carbon. And lots and lots of Gravel bikes. 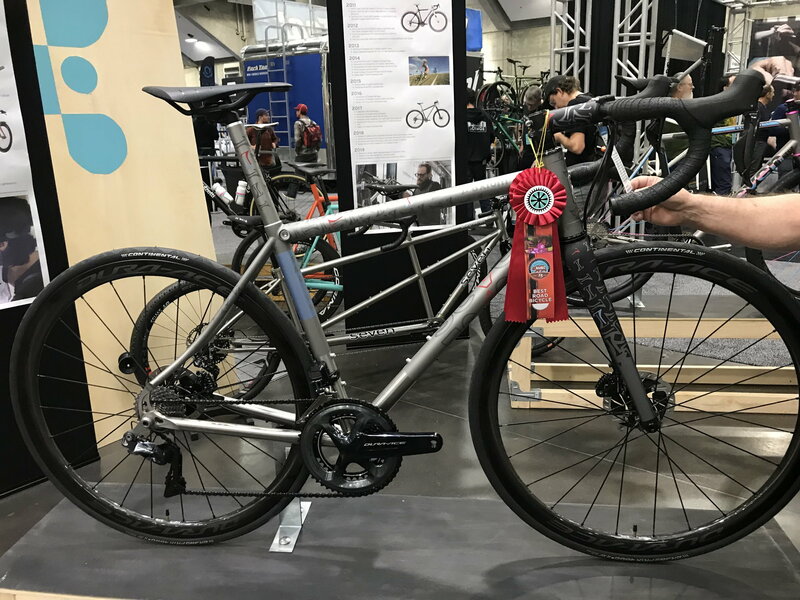 I guess we need a NAHSBS soon enough: North American Handmade Steel Bikes Show. It surprised me that there were a lot more wood and bamboo bikes than lugged steel.